Humans have stopped in their tracks to watch sunsets for millennia. Travellers are no exception, with holidays giving us enough time and enough sun-downer venues to appreciate the setting sun in style. Of course, sunsets mean different things to different people. For beach-bunnies they call time on the day’s tanning, while for clubbers the sunset signals the start of another epic night of dancing until sunrise. Loved-up couples hit the beach to stroll hand in hand, while frantic amateur photographers fire off shots to capture a changing sky of reds and orange, pinks and purples. Sunset has cocktail hours, fancy terraces, boat trips, balloon flights and chill-out music dedicated to it. Only the coldest of hearts aren’t moved by this most beautiful time of day. So in homage to the solar show, that I’ve made a point of watching, photographing and honouring over the years, here are just a few of my favourite sun-down settings in Europe. Cycle, climb or bus to this panoramic piazza in Italy’s breathtaking Renaissance city. 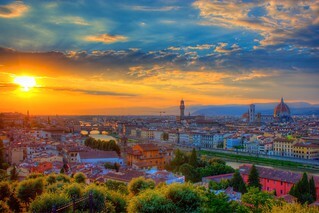 Piazza Michelangelo, high in the south east of the city, has uninterrupted views across Florence at sunset. Gaze west along the River Arno as the setting sun illuminates the water, the Ponte Vecchio and the incredible terracotta dome of the city’s cathedral, the Basilica di Santa Maria del Fiore. The mood in the Piazza Michelangelo is always laid back, with backpackers sipping red wine from paper cups and smooching couples sitting on the steps. Getting there: Take bus number 12 or 13, or walk through and up from the Oltrarno district. 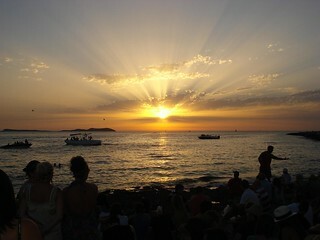 Café del Mar and Café Mambo on Ibiza’s west coast remain a classic sun-down spot in the Balearic Islands. Times have changed since my first visit here in the 1990s, when a blissed-out vibe eased us into another night of clubbing. Radio 1 discovered Café Mambo in the late 90s, helping to turn what was a peaceful strip of rocky coastline into a wooden promenade besieged by bistro tables, hefty drinks prices, designer shades and pounding tunes. Still, for all the obnoxious yacht action, parascenders and prats it attracts, Ibiza’s Sunset Strip will always have a place in my heart. I still get goose bumps watching the sun set at the absolute centre of a cloudless blue sky into the Mediterranean, perfectly in time to the music. Getting there: Take a path that hugs the coastline from San Antonio harbour to Sunset Strip. 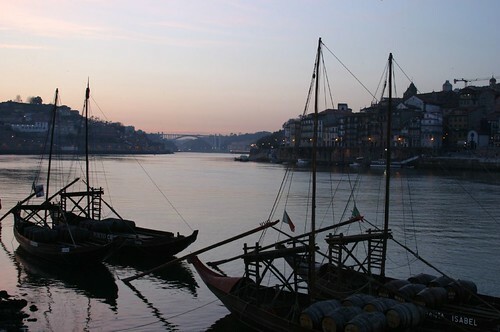 Emerging from the darkness of Porto’s famous port cellars, to see the sunset reflecting off the water of the River Douro is a memorable city break experience. The sinking sun casts shadows across the pastel painted shabby-chic townhouses that crowd the streets of the Ribeira district on the bank opposite. It also illuminates the replica rabelo boats that once shipped barrels of port down river. Porto’s intricate, weathered architecture is the focus of this sun-down spot, rather than the sun itself. When the light has receded, slip back into the darkness for another glass of the fortified wine that is named after Portugal’s second city. Getting there: Famous port cellars line a riverside road called Diogo Leite. Descend down into Porto’s river gorge on the Funicular dos Guindais and then cross the Dom Luís I Bridge. 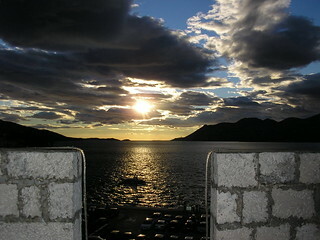 The reward for climbing up the tight wooden ladder to the top of Zakerjan Tower (also called Bokar Tower) in Korcula Old Town, on the Dalmatian Island of Korcula, are the cocktails … and the birds-eye view of the sun melding into the sea across the harbour. Prices are steep at Cafe Bar Massimo, but worth it for the unique setting and the views from the 15th century turreted terrace. Getting there: Turn right on entering the old city and follow a waterfront promenade called Setaliste Petra Kanavelica, saving the dozen or so restaurants for later. If you’re holidaying on the Greek island of Santorini, plan for the sunset and book a hotel on the west coast. You’ll be well positioned for sun-down views of the Santorini caldera (a cauldron-like rock feature created when its volcano collapsed) which is considered a natural wonder of the world by many. Otherwise head, like everyone else seems to, to the charming village of Oia high in the northern tip of Santorini. Give yourself plenty of time to take your seat on a whitewashed wall or step. Also good are the villages of Firostefani and Imerovigli, close to Fira. 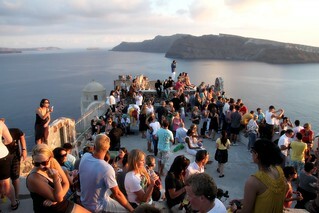 Weddings and cruises are timed to coincide with Santorini’s sunsets, proving how spellbinding they can be. Kelly Pipes is a writer and editor who has worked in travel and travel publishing for the last ten years, and has enjoyed every single minute of it. Alongside other projects she shares off-beat travel news and authentic travel experiences on her own blog, Sandwagon.